Author Notes: Adapted from Margaret P. Overton recipe given to Victoria. Recipe was also published with cute article about Mrs. Overton in NN Daily Press 7/28/61. 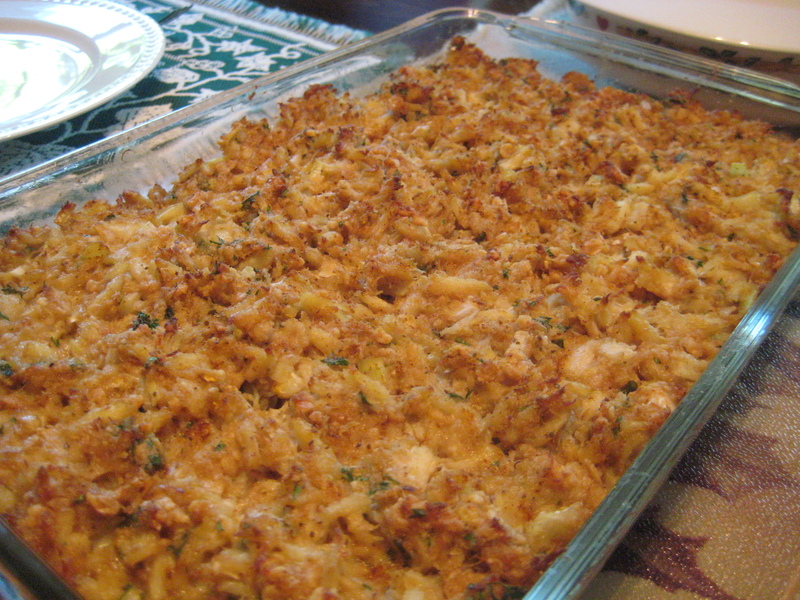 This is a family favorite at all holiday meals. Exactly one time it was not on the sideboard for a family gathering; as each of the grandchildren passed through the line, they asked where the crab casserole was. My sister and I have made this through the years for our own families and after the first taste, we pause. In my house, the response is reliably the same “good job, Mom, but it is not Victoria’s”. For crowd of 20 to 30 people, Victoria triples recipe, but not butter. She uses 2 sticks of butter for 3 pounds of crab. 2 boiled eggs, finely chopped. Optional – sieve yellows. Crush Saltine crackers in saucepan with ½ stick of butter and cook on medium heat until just golden. Set aside to put on top of casserole at very end. In a large bowl, gently pick through crab to remove any shells, trying to keep large chunks intact. Push crabmeat to sides of bowl to form a well in the center. Break up bread into bite-size pieces and put in well. Saturate the bread with the milk to mush-like texture. Add parsley, chopped egg whites, and sieved yellows. Gently fold all together, being sure to evenly distribute milk-soaked bread throughout. In separate small bowl mix mayonnaise, Worcestershire sauce, and white pepper. Pour on top of crab mixture without combining. Pour stick of melted butter over top of crab and gently combine all. Put in casserole and cook for 30 minutes or until gently bubbling. Add sautéed saltines to top of casserole and cook additional 5 minutes or until lightly browned. Options: Before cooking, can add 2 teaspoons celery seed or 2 teaspoons curry powder or juice of half a lemon.